Hero Class Mid-Shore Patrol Vessel CCGS M Charles M.B. 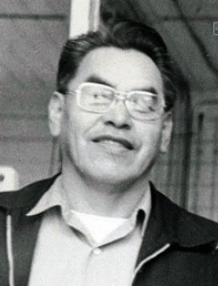 Ben’s rescue of Gaz and Heidi from Folger Island (Cedar, Salmon and Weed, p.31) on a dark and stormy night was inspired by a similar Folger rescue by Seaman Martin Charles (Hereditary Chief of the Nitinat Band, over thirty years service at the Bamfield Life Saving Station and recipient of the Medal of Bravery). 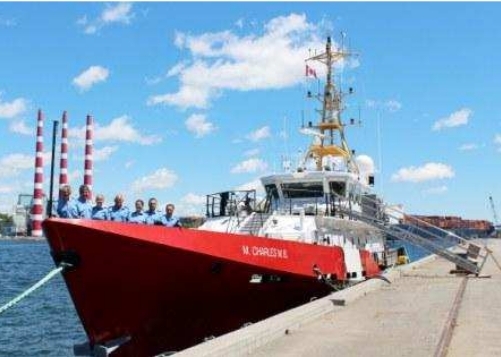 Martin was further honoured by having a Hero Class Mid-Shore Patrol Vessel named after him: CCGS M Charles M.B. This event, at Centennial Pier, Port Alberni, on 20 May 2015, was witnessed by a few hundred guests, half it seemed who were related to Martin. His granddaughter (self-declared “best granddaughter”) Sheila Charles christened the boat. Everyone seemed intent on establishing their connection to this larger than life man and I would be remiss if I didn’t note that we have spent the last forty years living in the Martin family Port Desire home.